Sarita says that if we find a harmonious alignment between all aspects of our being (conscious, subconscious and unconscious) we will live a balanced life, even during Kali Yuga. One of the delightful memories from my childhood is this one. I am 3 years of age and it is a warm and sunny morning in the back garden of my home. My mother is hanging wet laundry. The laundry waves in the morning breeze as the gentle sun gives rise to a delicious sense of pleasure and anticipation of discovery. Butterflies dance with flowers and bees hum, butterflying their busy work of gathering nectar. The garden is enchanted as I gleefully chase the colourful butterflies, trying to fly as they do. My mother lovingly explains to me that because the butterflies gather pollen, the trees will later bring forth fruits. And by gathering nectar from flowers, bees create honey, which then becomes our delight. As she explains nature’s miracles to me, my ecstasy escalates, expanding into the infinite blue sky. I hop, skip and jump through the garden and then lay down on the ground, gazing at fluffy white clouds. My ecstasy transforms into gratitude for being alive, merging with this beauty. “A shocking new United Nations study finds that bees, butterflies, and other pollinators are in even greater danger than we previously thought — and may even be at risk of extinction. Conducted by a top team of 70 UN scientists, the report is the first-ever global study on the health of bees and other pollinators. And the results are much, much worse than many expected. “Meanwhile, Bayer, one of the world’s biggest producers of bee-killing pesticides, is suing the European Commission to lift its ban on the pesticides that are driving bees toward extinction. Without bees and other pollinators, the world will face a global food crisis. Almost 90 percent of all flowering plants rely on pollinators – including 75 percent of the world’s food crops. “In other words, when bees die, people starve. “Of course, we’ve known for a long time that bee populations are in decline. But this study shows that the threat of global extinction has risen to a whole new level. I put my head in my hands and feel grief. If killing bees and butterflies for the sake of more pesticide sales is what humanity has fallen to, I am ashamed of calling myself human! How is it possible that in a mere ½ century, we have arrived at this point of destroying the incredible and abundant gifts of Gaia upon which our survival depends? I need an explanation, a mystical insight to explain this situation with the human condition. It appears the collective human shadow is so great that we now identify only with shadows, forgetting the light. How did this happen and what is the cure? Knowing that Mother India gave birth to great mystics with far-seeing abilities, I looked up clairvoyant predictions from sages who lived more than 5000 years ago. Ancient spiritual traditions from India and other places in the world speak about cycles of creation and destruction, the old collapsing and a new cycle of life emerging from the ashes, like the proverbial phoenix. These cycles have been mapped by far-seeing sages, for our benefit. There is much debate among scholars as to the true interpretation of these predictions. One scholar, named Bibhu Dev Misra, has combed through countless texts and scriptures worldwide to try and find a coherent interpretation. 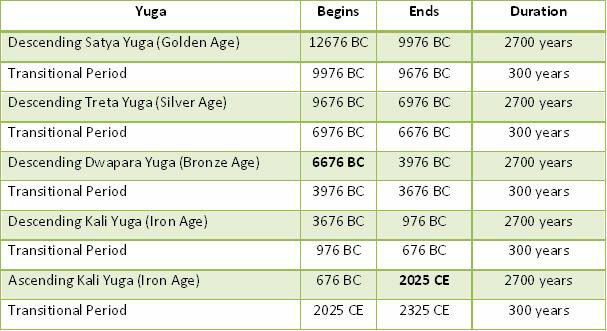 Below, you will see a description of the 4 Yugas (cycles), with dates. Each cyclical age is followed by a transitional period, which we can think of as a bifurcation, an in-between era of death and renewal. The first age is called Sat Yuga (known to be a golden age where humanity is perfectly in tune with divinity). The second is Treta Yuga (the purity of humanity is already becoming tarnished and codes of conduct come into being). The third Yuga is Dwapara (where power issues become prevalent). The fourth Yuga is known as the Kali Yuga (when all is chaos, war is prevalent, and destruction is imminent). We are currently in the Kali Yuga and this is due to end in 2025 followed by a transitional period when full meltdown happens in preparation for a new beginning, a new cyclical wave. Thieves will become kings and kings will be the thieves. Base men who have gained a certain amount of learning without having the virtues for its proper use, will be esteemed as sages. Predatory animals will become more violent. Foetuses will be killed in the womb of their mother. Young girls will trade in their virginity. The god of clouds will be inconsistent in the distribution of rains. The state leaders will no longer protect the people but will appropriate more wealth through taxation. Brahmans will not be learned or honoured, Kshatriyas will not be brave, Vaishyas will not be just in their dealings. How we weather the storm of the Kali Yuga all depends on how much we can raise our consciousness. The chaos cycle we are now in is certainly destructive, but it is also creative. I have heard Osho say: “Out of chaos, great stars are born.” When we are in a chaos cycle, old patterns are shaken up and it is an opportunity for creative people to manifest a new vision for the world. Reading The Positive News, it is clear that much is underway for the healing of nature and humanity. I have heard of seeds surviving thousands of years, waiting for the right climatic environment to sprout forth fresh green shoots. Within each one of us are seeds for the Sat Yuga. We can draw on this as a resource. Each time I sit in meditation, I feel the golden age alive within. I have discovered that the mantra, ‘Sat Chit Anand’ works wonders for awakening this divine state of being. Sat means truth, Chit means consciousness and Anand means bliss. Encoded in this small mantra is the seed of the entire Sat Yuga. As we move through life during this Kali Yuga, we can, in our thoughts, words and actions, continue to plant millions of seeds of ‘Sat Chit Anand’, giving them resilience to maintain till such a time as they can blossom into rich and verdant foliage, renewing this earth and all inhabitants with the bliss that is our essential nature. Each chaos wave offers us the opportunity to ask, “What can I learn from you?” By embracing the chaos with awareness, we are simultaneously opening to a higher level of evolutionary flow. The great yugas, which span thousands of years, are simultaneously within us at all times. We hold the blueprint of all the yugas and because we have free will, we can choose which form of reality we wish to inhabit. I have heard Osho say that Sat Yuga represents superconsciousness, Treta Yuga the conscious mind, Dwarpa the subconscious mind and the Kali Yuga the deep unconscious mind. To be in a state of wholeness we need to find harmonious alignment between all the aspects of our being. The conscious, subconscious and unconscious aspects need to be in service of superconsciousness, then we will live a balanced life, even during Kali Yuga. Some will feel a great attraction to form conscious eco-communities, living in harmony with others and with nature, being aware of Godliness within this body and this earth. Some will become activists, fighting the deeply destructive and unconscious behaviour of the powers that be, who seek annihilation through greed, rather than creation through love. The call to awaken even while in the midst of chaos is felt as a deep desire to be in service of love, meditation and beauty in all of its multidimensional forms.